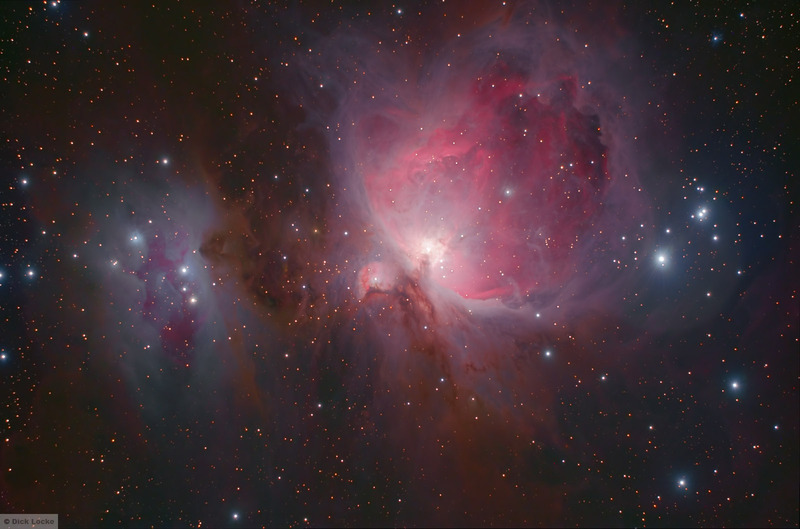 The Orion Nebula (M42) is a stellar nursery. New stars are in the process of forming in this part of the galaxy. There are two types of nebula shown here. The blue reflection nebula is present in NGC 1977, also called the "Running Man Nebula", in the left object. There is some reflection in many parts of the frame as well. The Orion Nebula has rich red areas of the hydrogen alpha emissions. This is a florescence, where radiation is causing clouds of hydrogen gas to glow. "Located at a distance of about 1,600 (or perhaps 1,500) light years, the Orion Nebula is the brightest diffuse nebula in the sky, visible to the naked eye, and rewarding in telescopes of every size, from the smallest glasses to the greatest Earth-bound observatories and the Hubble Space Telescope." says SEDS. Robert Gendler has published some good info on M42 and NGC 1977. Links to more info, APOD, and Hubble from there. About this wide view of the Great Nebula in Orion, M42. This was constructed of 19 Ha, 11 Blue, and 25 S III exposures, 45 total (all 5 minutes each); 3.75 hr. total. In addition to the "great" and running man nebulae the subtle structures in the surrounding areas are interesting. This narrowband image Starry Nights in January 2017. AP 900GTO mount, SBIG ST-8300 camera along with the Takahashi FSQ-85 "Baby Q" telescope (with the reducer). My processing techniques and workflow are discussed here. 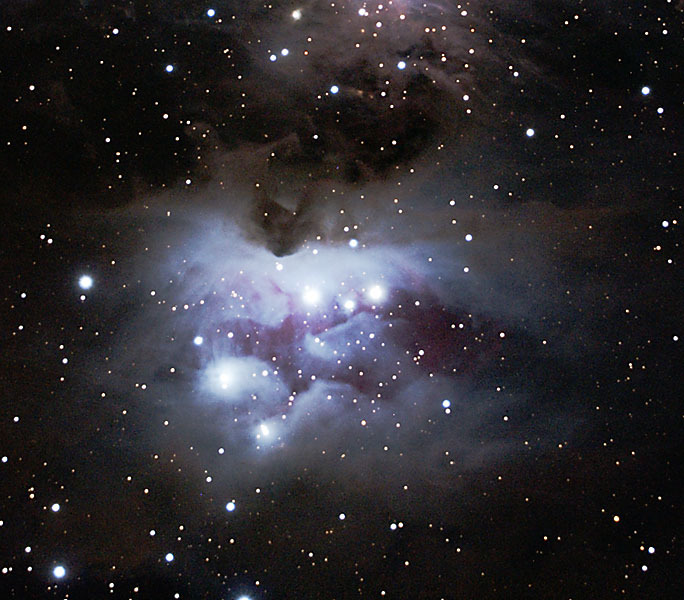 Image Notes: I acquired the images for the above M42 in West Texas, December 2010. It consists of 49 short exposures (10 sec and 30 sec) combined with 22*5 minute shots. I had performed basic processing on the images over a year ago, but was somewhat reluctant to tackle this difficult-to-process object. The tremendous brightness of the center-core makes it a challenge to include detail there as well as the larger and dimmer objects. Much of the processing on this image is based on Jerry Lodriguss' layer masking technique as he describes here. Chanel is using the black and white version of M42 in some 2011 press release material. 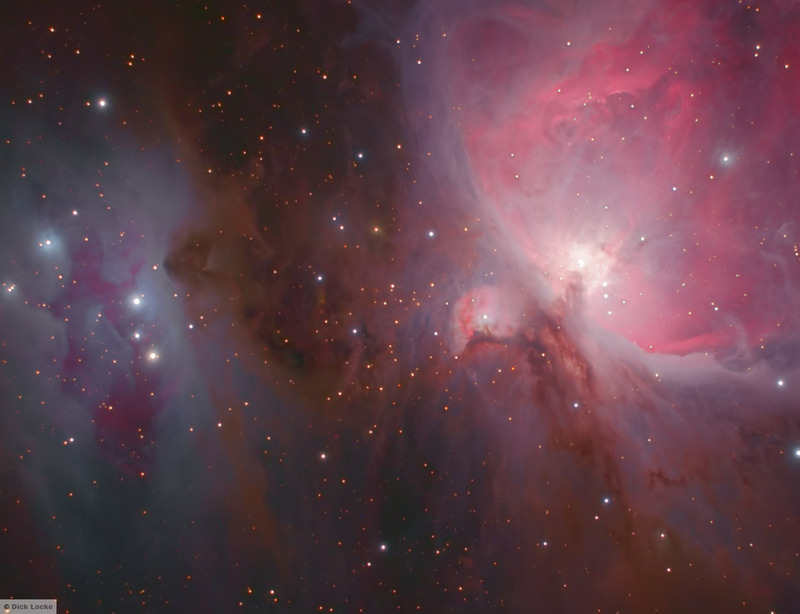 The Orion Nebula (M42) is a stellar nursery. New stars are in the process of forming in this part of the galaxy. There are two types of nebula shown here. The blue reflection nebula is present in NGC 1977, also called the "Running Man Nebula", in the left object. 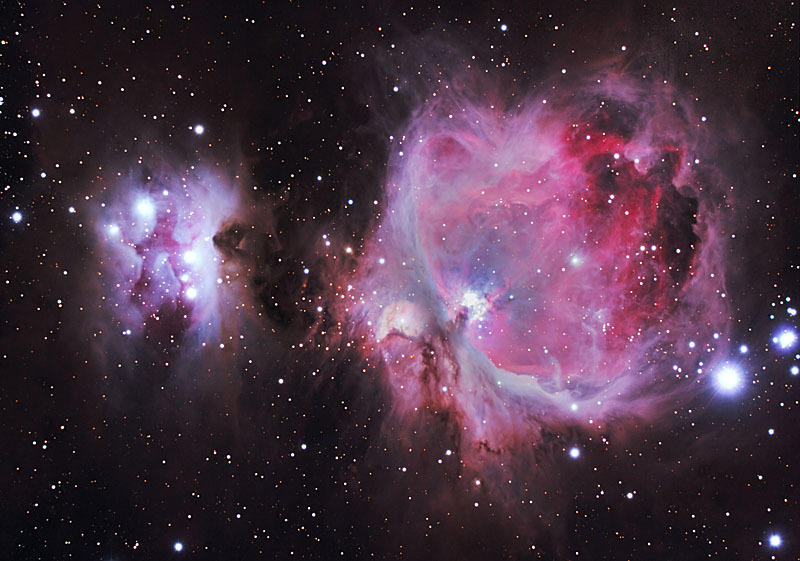 The Orion Nebula has rich red areas of the hydrogen alpha emissions. This is a florescence, where radiation is causing clouds of hydrogen gas to glow. Notes on 2006 images: I tried to process this version to enhance the darker dust lane areas, which I think are very interesting. 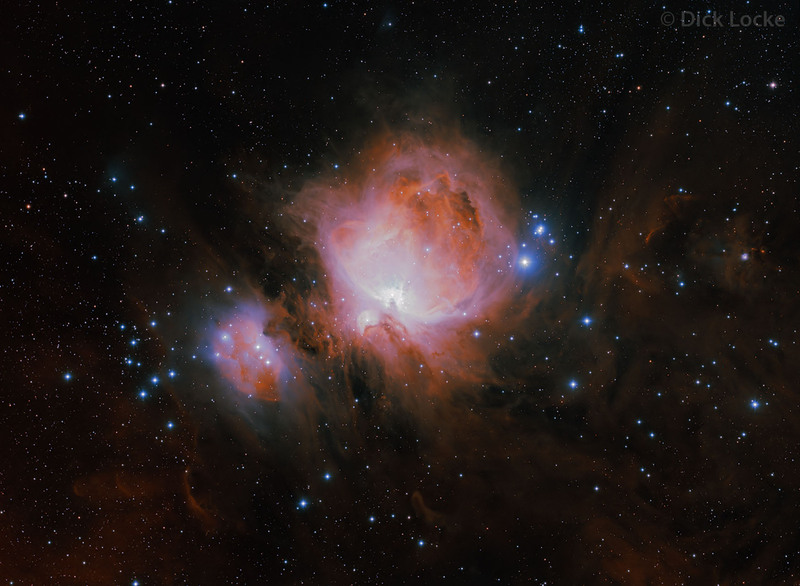 M42, the Orion Nebula, is a great area to view and photograph. It is very difficult to process images of this region, though, because the core area is extremely bright relative to everything else. It's bright enough to activate the color sensors in our eyes, and is often described as having a greenish glow. It looked blue from the back yard last night. Do you suppose that the bright moon might affect the perceived color of M42? Combination of 20x4 minute exposures and 5x1 minute exposures (85 minutes total exposure). Takahashi TOA 130 (a 5" APO refractor) and Canon EOS D20a. Above was a crop of a working version, just for fun!